Best JEE Main Books 2019: JEE Main Books will provide the correct direction to your JEE Main preparation. Have you ever felt like a fish out of water when it comes to searching for the best JEE Main books? Every book is supposed to be ‘the‘ book to crack JEE Main and every author the ‘best‘. No one wants to end up with the wrong JEE Main books. Nor does anyone wants to end up with too many right JEE Main books! How do you make a decision then? At Embibe, we believe that self-study is what makes a student score well and bag a good rank in JEE. Coaching and tuition are just the facilitators towards achieving that target. Good mentors and teachers are important, but what is more important are the best JEE Main books that you use to refer to for your JEE preparation. JEE Main Exam is around the corner! Are you worried about the JEE Main 2019 paper? We have your back! India’s best data scientists have analyzed the JEE Main papers of the last 22 years on various parameters like the difficulty level, syllabus coverage, ideal time for each question, questions involved with multiple concepts, repetitive nature of concepts, etc. Keeping these parameters in mind, they have generated the JEE Main Predicted Question Paper that is verified by the senior academic experts from across the country. Embibe’s JEE Main January Predicted Question Paper is India’s first and only predicted test powered by AI and data science, having 95% chapter similarity to the actual JEE Main January question papers. The NCERT standard books used in CBSE board are a preferred choice for JEE. They contain the right amount of information in an easily understandable way. This is why you should definitely read the NCERT textbooks before you go for more advanced, difficult textbooks. Remember, you need to clear your basics first and for that, NCERT textbooks are the best. Once your fundamentals are strong, you can use other JEE Main Books that are of a higher level. 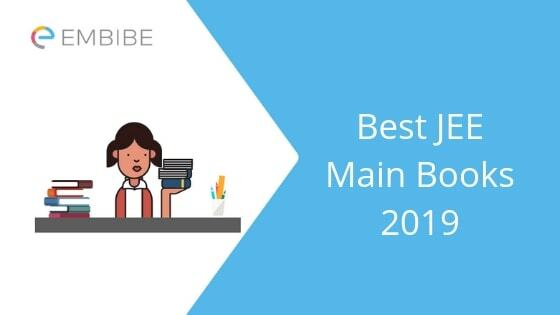 Below is a list of some of the best JEE Main Books besides NCERT textbooks that you should definitely consider using in order to crack JEE 2019. These books are recommended by subject matter experts after careful research. They are the best recommended as they explain the concepts in a way that is easy for students to understand and retain them for longer. JEE Main Exam Pattern provides details about the number of questions, subjects covered, marking scheme, etc. JEE Main Paper-1 is conducted for admission to B.E./B.Tech courses. Subjects Physics, Chemistry and Mathematics subjects. Number of Questions 30 questions will be asked from each subject with a total of 90 questions comprising of 360 marks. Language For all exam cities, the question paper medium choice will be English and Hindi (except exam centre cities in Gujarat, Daman & Diu and Dadra and Nagar Haveli where choices for question paper will be English, Hindi, and Gujarati). The choice for question paper should be exercised while filling up the application form. Exam Duration The time duration will be 3 hours. Marking Scheme Candidates will be provided with +4 marks for each correct answer. There is a -1 negative marking for each wrong answer. JEE Main Paper-II is conducted for admission to B. Arch/B. Planning courses. Exam Mode Mathematics- Part I and Aptitude Test- Part II are Computer Based Test (CBT) mode only. Drawing test- Part III is Pen & Paper Based Test (Offline). Drawing test is to be attempted on a drawing sheet. Number of Questions 30 questions will be asked in Mathematics (Part-1), 50 questions in aptitude test (Part-2) and 2 questions in drawing comprising of total 390 marks. Marking Scheme For Mathematics and Aptitude test, candidates will be provided with +4 marks for each correct answer and -1 for every wrong answer. Type of Questions The Mathematics and Aptitude test section will contain objective type questions. Drawing test will be subjective. Learn all JEE Main important chapters and concepts for free on Embibe. Who needs so many books when you can learn it all in one place? Embibe provides a unique way of learning to students through the Knowledge Tree which helps a student learn and understand concepts better and faster! The Knowledge Tree shows how interlinked concepts are linked to one another so students have no difficulty in relating to their derivations and connections. Take a free JEE MOCK TESTS on Embibe to find out your strengths and weaknesses in individual subjects. Embibe also lets you practice JEE Main practice questions that toppers have been consistently getting wrong over the previous years. We hope this detailed article on JEE Main Books helps you in your preparation. If you have any query regarding JEE Main Books, drop a comment below and we will get back to you. Krane book is a part of the original Physics series and Walker is the latest of the Fundamentals of Physics series. But I would recommend you refer to HC Verma and DC Pandey for IIT JEE prep.